Today concludes an exciting and informative week in France for CapeRay’s CEO Kit Vaughan who has been a guest of the French Ministry of Foreign Affairs. 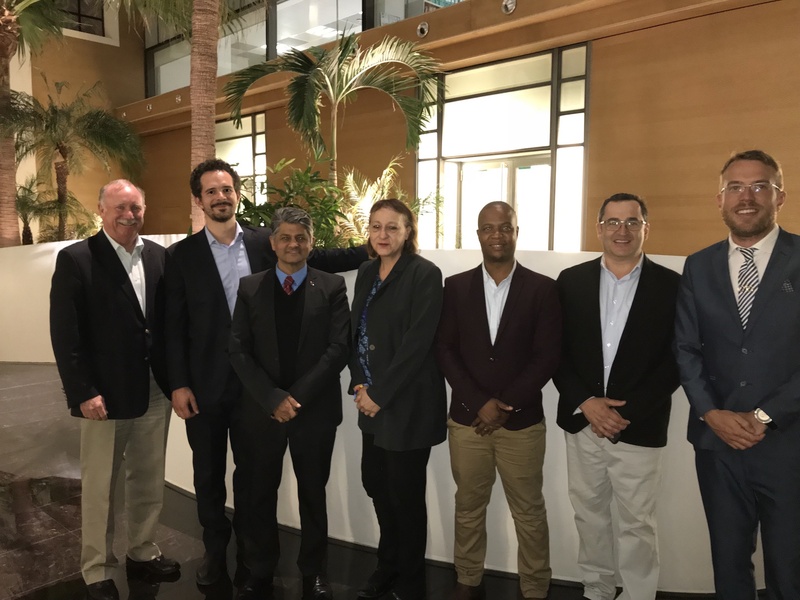 CapeRay was one of five South African companies (seen below left) plus another 24 from the USA, Italy, Taiwan and South Korea to have been selected to participate in the Young Enterprise initiative (YEi) with the aim of strengthening business links with France. The programme started in 2005 with American companies, while South Africa (SA) was invited to join YEi in 2016. Jointly funded by France and SA’s Technology Innovation Agency, three of the SA firms represent the MedTech industry, while the other two are focused on CleanTech. Altis Biologics has developed an osteogenic bone matrix implant, manufactured with a patented bioprocessing method; Kebelapile Technologies has developed an early warning system – based on a mathematical algorithm – that predicts the threat of an asthma attack; and CapeRay has built and clinically tested a dual-modality imaging system for early detection of breast cancer. CoCo’s Solutions has formulated specialised nano-coatings to protect high voltage electrical networks; while Mellowcabs manufactures electric vehicles that provide low cost and emission-free taxi services. The first three days of the programme took place in Paris where there were three main activities: workshops; private meetings; and events. The workshops included topics such as: doing business in France; financing your company; the Hello Tomorrow Challenge; how to deal with French banks; intellectual property; and recognising cultural differences. It was during this latter workshop that laureates learned about the endearing French custom of greeting strangers when you enter an elevator and then wishing them goodbye when you leave. Hence the title of this blog: Bonjour et Aurevoir! CapeRay’s private meetings included opportunities to explain the company’s patented dual-modality imaging system to representatives of the Curie Institute and the French Society of Radiology One of the events, hosted in the atrium of bpifrance, was a chance for each of the 29 laureates to deliver a one-minute pitch about their company, followed by a well-earned glass of champagne! After three days of immersion in Paris, each company then transferred to a region in France chosen specially for its ecosystem. Kit Vaughan visited companies in two regions: Vermon, located in Tours in the Loire Valley, that manufactures the ultrasound probe in CapeRay’s Aceso system; and SuperSonic Imagine, located in Aix-en-Provence, that is a leader in elastographic ultrasound imaging of the breast. It has been a productive week that will no doubt lead to further opportunities in the future. Hell, and I thought that Bonjour et Aurevoir referred to either the ‘Boks chances in France or Mugabe’s exit! A fantastic visit, Kit, with great opportunities in the offing. We look forward to the follow-up. Wonderful, Kit – and Aix en Provence must have been such a cherry on the top of this exciting French engagement. Have been quiet, but still read and love your blog. Thanks for the positive comments, Eb and Marian – much appreciated! Believe it or not, I started an online French course before this trip, having last studied the language in first year varsity – 45 years ago, back in 1972! – but I did not get to use my limited knowledge as often as I would have liked. That’s just another way of saying I look forward to returning to Provence! Tout ce qu’il y a de mieux pour vous deux.